From Steve: I have it on good authority that St. Augustin’s intends to pursue demolition of the two 100-year-old homes it owns adjacent to its parking lot on Grand. These buildings are listed as contributing structures in a National Register Historic District. A serious potential buyer is working to evaluate moving the structures, and the church is required by agreement with the City to facilitate this resolution… they have been actively avoiding complying with that agreement, going so far as to file a lawsuit against the City. If you have an interest in historic preservation, I encourage you to communicate to your council representatives and encourage them to delay issuing a demolition permit until one of three things has occurred: the potential buyer has completed evaluation of relocation, a redevelopment plan has been approved, or two months has passed. The key is to ask for a “cooling off” period. We only get one shot to save these historic buildings – when they are gone, they are gone. St. Augustin’s has not communicated a plan other than to tear them down, so it is clear that there is not an immediate need. A period of two more months would not adversely affect the Church, except that they want what they want. This is an emergency… the Council meeting is Monday, August 26th. 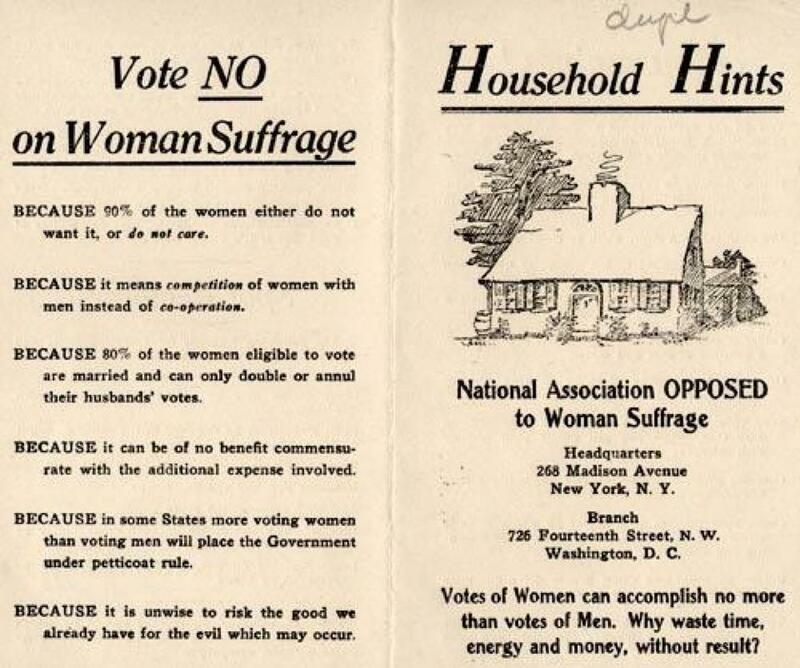 The more people who communicate by then, the better chance of averting a complete loss of these historic homes. This is a two-story hip roof Classical Revival style house plan. The house fronts south on Grand Avenue but it has a double façade, with semi-circular roofed dormers fronting to the south and east. A frame wrap-around porch covers the south half of the east façade and the west part of the south façade. The main chimney with corbelled cap is located on the east end of the main roof ridge. A secondary chimney, equal in scale but unadorned, is on a rear wing. There is no garage but there is a porte cochere to the west of the house. This is a two-story Classical Revival style hip roof house plan. The building massing is complicated. The core rectangle is elaborated with a three-sided full-height bay at the east (right) side of the façade, while a shallow wing on the rear of the east wall also features a full-height three-sided bay projection. Hip roof dormers are placed above each of these bay projections. The architects were Liebbe, Nourse and Rasmussen – a well respected historical Des Moines firm. Last night, I sat next to my husband, watching news from the Boston Marathon, and I turned to him and said “I think we should have kids.” To which he responded, “OK, but maybe we should wait a few months and make sure you still feel that way.” And we smiled. I’m a marathon runner, with three finishes, my fastest time barely making my goal of “starts with a 4” at 4:59:58. And while I was born and raised in the New York metro, my parents and sister have all relocated to the Boston metro. My sister has been known to go watch the marathon, so yesterday felt too much like 9/11 for me, only combined with the added sorrow of knowing what it takes to complete one marathon, let alone run one to qualify for Boston, then train again to run “the” Boston Marathon. When I ran the Marine Corps marathon in October of 2001, it went by the bombed out Pentagon four times. I was pretty focused on my training, and had trained to run a 4:30 pace. But as I ran past that building, past all those Marines, all those families, I couldn’t keep my focus. My college roommate ran a few blocks with me at mile 14 or 15 and she was ecstatic for me, because I was still on 4:30 pace, but at that moment I knew I couldn’t do it. I didn’t want to race through this day. I wanted to savor it, to honor the race by loving it, not trying to beat it. So I dialed it back, and started to just run for pleasure. And this is what I learned: the slower I ran, the more fun people around me were having. There were costumes, and funny stories, and just more general antics. I don’t remember anything but the Pentagon from the first 15 miles, but I remember so much from the last ten miles, I will never regret my 5:29 finish. That’s what hurts more today. The people at that 4+ hour pace are my people. They run for fun, they run for charity, they run for all the days they didn’t think they could run a marathon, and for the lifetime of saying that they did. It breaks my heart, the families that were made to suffer yesterday, the runners in the back of the pack that never got to finish, or got to finish, but won’t get their day in the sun as Boston Marathon finishers. All I could do last night is think about 9/11, and how I got through that day and the weeks that followed. I remember sitting with my husband, in the seventh year of our marriage, and having that life-altering conversation: “I think we should have kids.” I’d been pretty much against having kids until then, but my take away from a day spent frantically searching for friends and loved ones from my island in Des Moines was that we might not have kids that would cure cancer or bring on world peace, but I was pretty sure we could raise good people, and maybe the world could use a few more good people. My wish is that we all find the silver lining in this tragedy. I’m not asking you to go reverse your thinking on childbearing, although I think my two kids, age 5-3/4 and 10-1/2 are decent arguments for parenthood. Maybe volunteer in your community with at risk kids, or spend more time with friends (no, Facebook chat does not count). Or you could send something to Boston Children’s Hospital from their wish list. Or go running with friends (there’s a local run in honor of Boston getting organized, with info here). At any rate, I just wanted to say, Boston, we’ve had our differences, but we are with you today. Pumpernickel is very helpful with wiring. He loves rewiring. 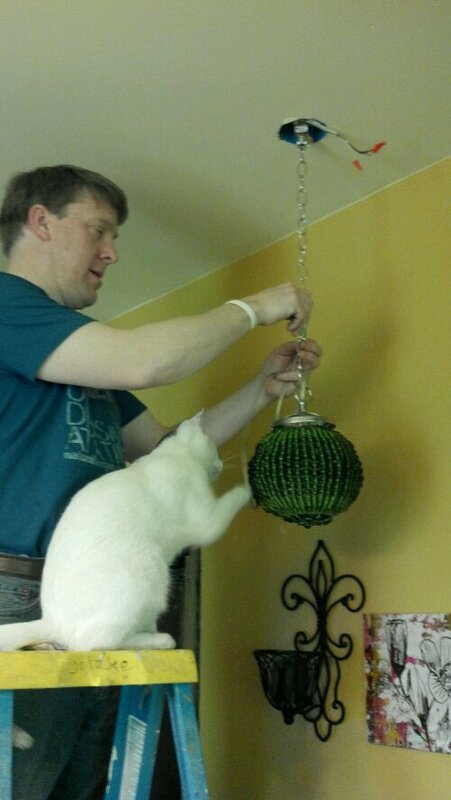 Kitten helps hang a new fixture over the sink. As well as hanging lights. I’m sure you’ve all been wondering how Pumpernickel, the Danger Kitten, had been doing. It’s been almost a year since we adopted him from the Animal Rescue League, and he’s turned into a very sweet attention hog around the house, if not around this blog. So I’ll give him a little play time around here. First of all, Pumpers loves to get high. 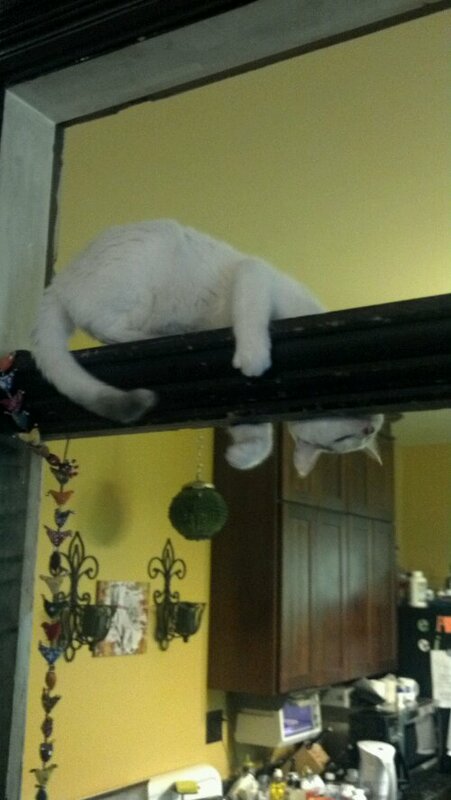 He jumps from counters and shelves to the tops of doors, climbs ladders, you name it. He may look like he’s scared for his life here, but he’s actually trying to reach the string with a bell on the end that’s behind him. (He eventually got it, and I eventually had to pull him down from this perch, as I’m pretty sure he would have stayed there all day). You can also find Part 2 and 3 here. Oh…that Victoria Barnes. 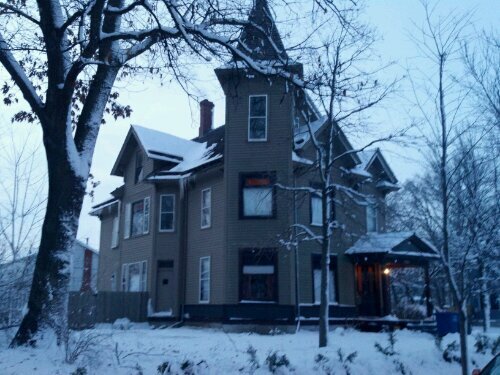 Have you seen her blog about restoring a 1890 house? It’s everything my blog would be, if I had time, drive, a staff….maybe one day. She probably had no idea the trouble she gets me into, posting her projects, getting me to think about the thousand things I could add to my thousand line to-do list, but now, she’s really done it. Last week, she post her blog link up party, and I’ve spent ever since then trying to pick my favorite find to participate. Oh sure…why not ask who my favorite child is, while you’re at it? At first I thought, oh easy….my favorite find is this house. I looked for YEARS to find the perfect home. Do you have any idea how hard it is to find a 4 bedroom, huge kitchen, not too done, but liveable historic home in Des Moines, Iowa, where they destroyed many primo properties when the built highway 235? It’s damn near impossible. But I found it. I remember standing on the front lawn, Friday December 3rd, 2010, using my Droid as a flashlight to shine through the dark at the quarter turned tower, stalking the interior wood work, practically jumping up and down that I’d finally found my house. Little did I know it wouldn’t actually be mine for another 53 weeks, thanks largely to Wells Fargo’s fiasco of a short sale department, but it’s mine now, and that’s what counts. But then I thought that was boring, that I should tell a story about one of the super cool things I’ve found for the house….the chandelier for the dining room, the new fireplace mantle, the new kitchen chandelier…I’ve had so many great finds lately that I haven’t had time to write about yet. Only trouble is, none of them are really done. 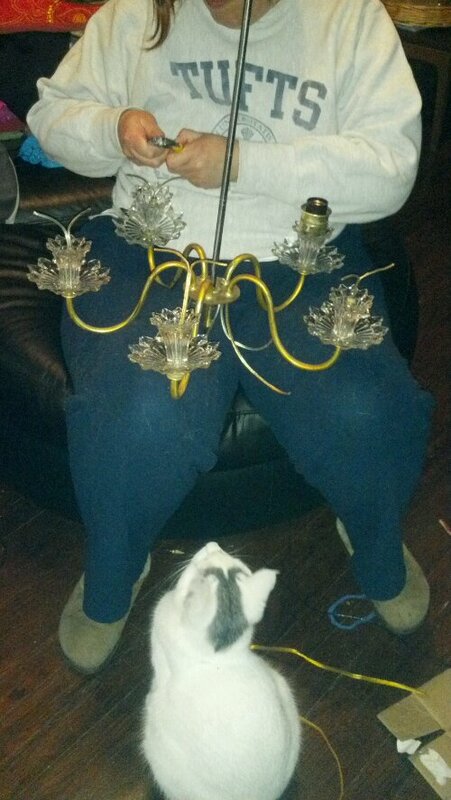 I haven’t finished the medallion for the dining room, the mantle needs to be refinished, and I spent a fair amount of time since her little announcement racing around trying to finish cleaning and rewiring the new chandelier for the kitchen. I got more done this weekend, thinking about this post. We got two lights hung that were things I had left over from my store, Simply for Giggles, that I determined were never really meant to be sold, they were meant for me. I got brave and totally disassembled a chandelier (and yes, I was thinking of the chandelier using the Short Circuit voice screaming “No disassemble!” the whole time). Remains to be seen if the chandelier comes back to life. And as to what will make the final cut for my best find ever….you’ll have to tune in tomorrow!